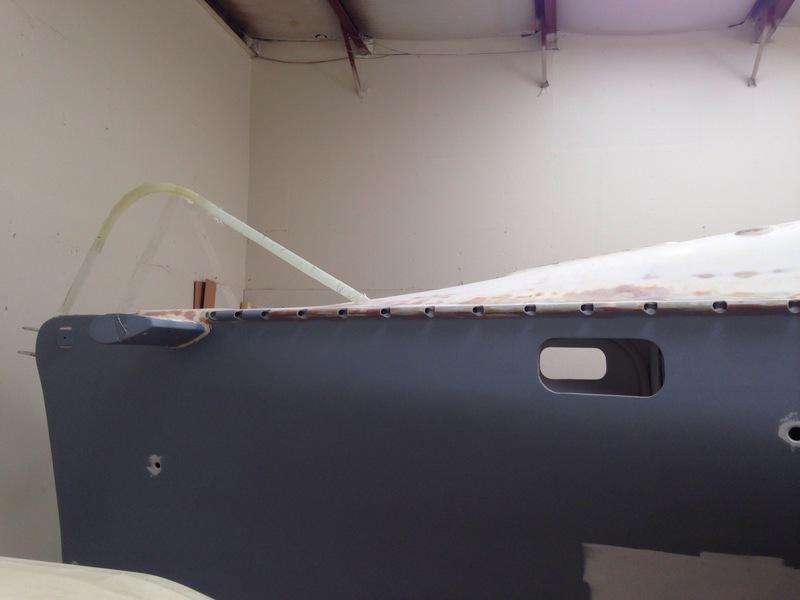 How many times have you heard, “a good paint job is 90% about the prep”? I guess that makes tomorrow our moment of truth, as there’s nothing left to do but start rolling & tipping the deck on a fine April Sunday. The whole exterior of the main hill is 220grit sanded down to the waterline. 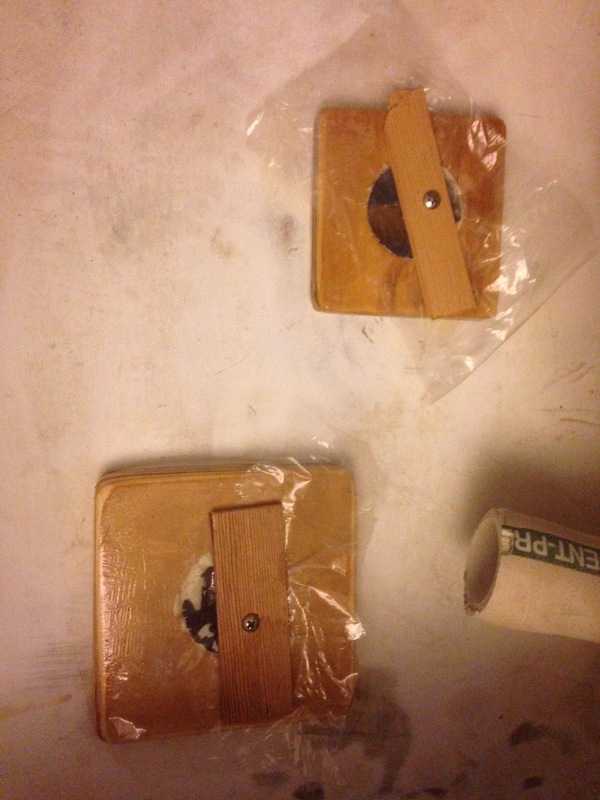 It took half of Friday and all Saturday to finish sand (and of course fill and re-sand three more little pinhole fields). 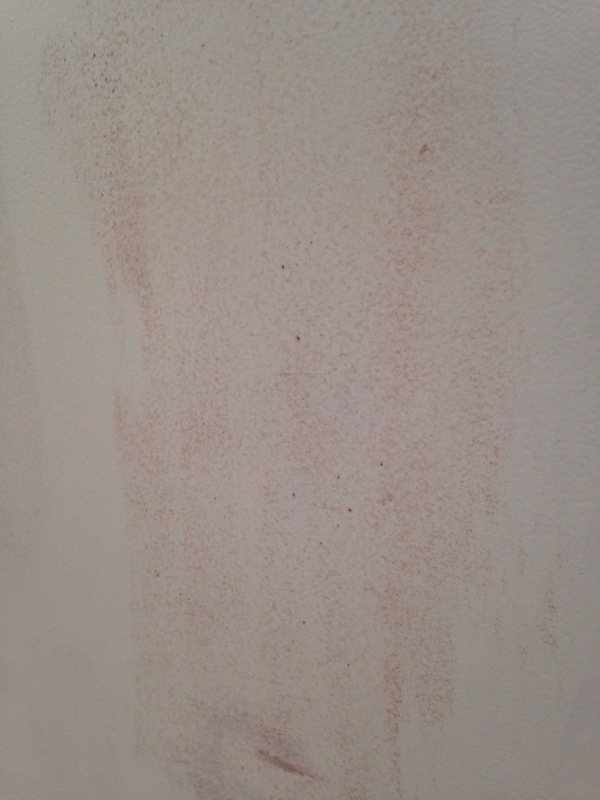 That includes sixty bucks spent on the commercial painter neighbor’s assistant. 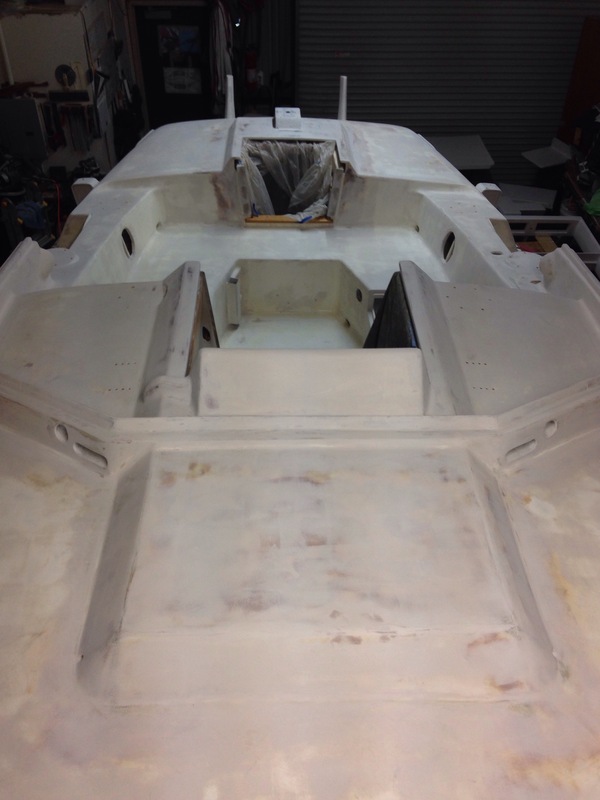 He hand sanded the net lashing tubes all along the hull, plus the entire cockpit and windshield base, because I was just too damn sick of these picky areas that have taken too many amateur hours. 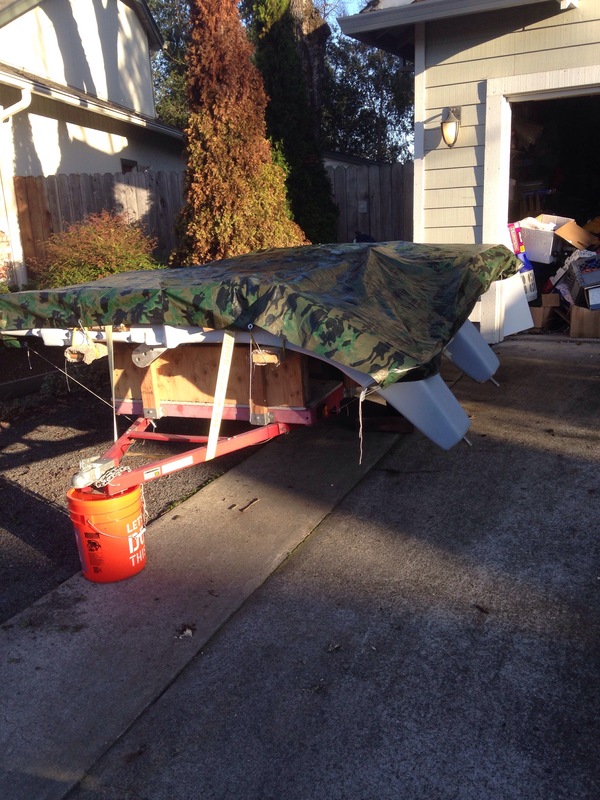 Tucked in to that photo are the 16′ boom, 6.5′ rudder, stern radar / windvane tower, engine bracket / sled, lazarette lid, and main cabin and aft cabin hatch covers. There’s not enough room in the shop to spread everything out properly, so we’re juggling moving stuff inside and out during the day. Ok, we’ll watch more YouTube videos for reminders on roll&tip boat painting, and cross those fingers for a good looking deck tomorrow. Never mind The Donald and Hillary and Bernie, etc. 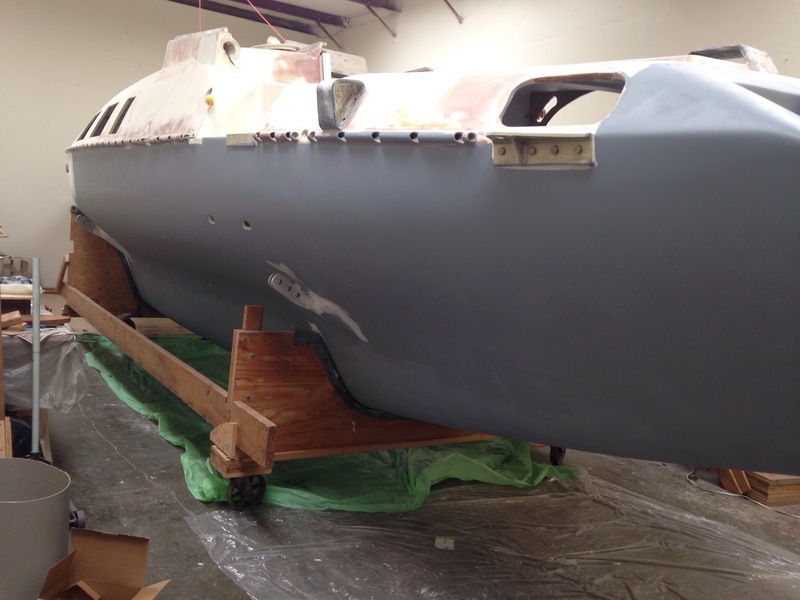 Over here we’re focused on finishing up the Primer work and starting the final paint! 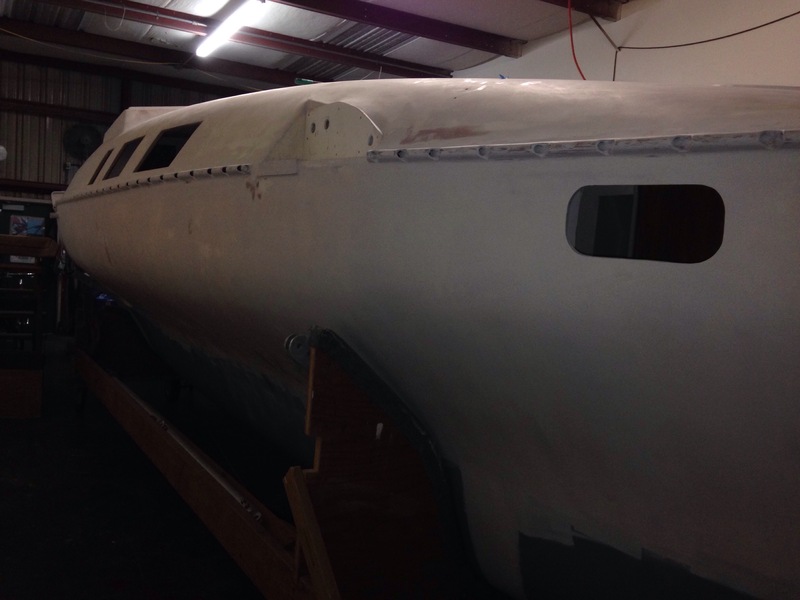 The good news for us is that’s the last of it, and the second coat of primer, where needed, goes on this evening. 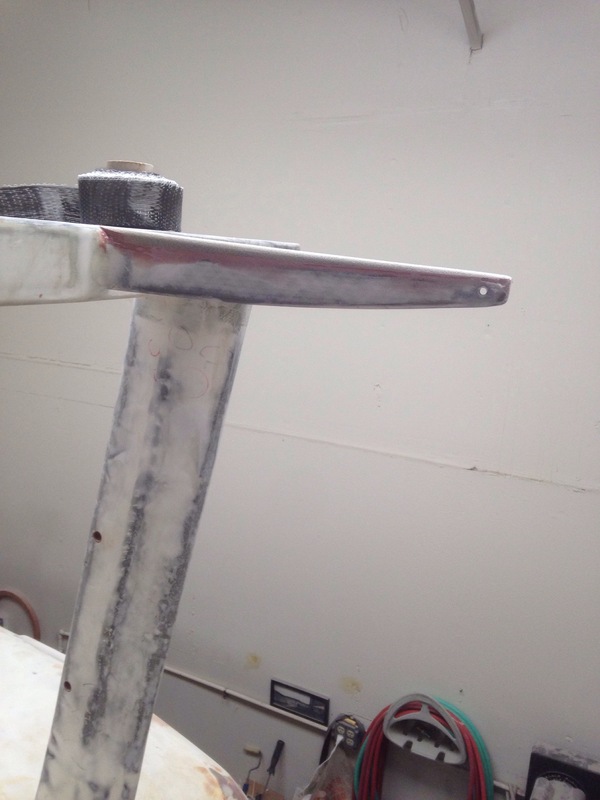 Then we’ll sand it all down to 220grit and begin final painting the deck with Interlux Perfection two-part LPU. 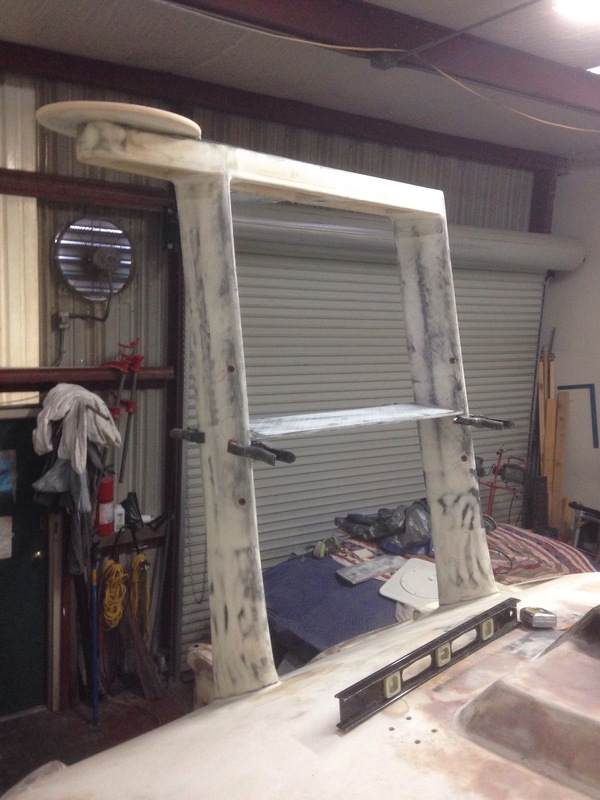 Off white for the deck (same as the floats) and Platinum for the topsides (same as the mast and beams). I just ordered some West Systems roller covers, as everything sold locally disintegrates with the solvents in these paints, leaving roller residue in the surface. 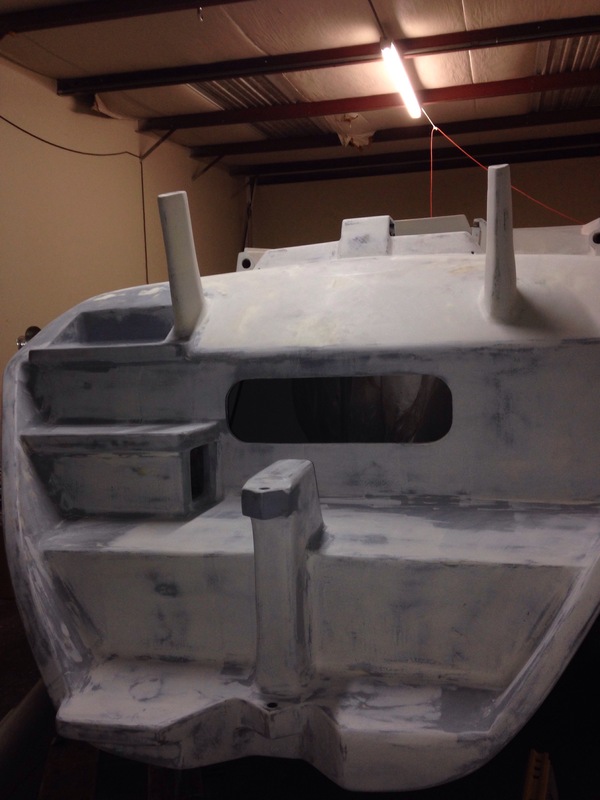 We can sand that away at the primer stage, but it would be a disaster in the final paint. If anyone has an actual roller cover brand name personally proven to withstand marine two part paints, please let me know! Boat parts in the driveway! Just before thanksgiving we lost the shop neighbor’s storage space for this little trailer holding the finished beams. It’s been crowding the shop and now that we’re serious about painting, the trailer had to move. Seeing the beams in the driveway is rather motivating to keep working! They were fixed with a thin slurry of red-balloons putty; nice and runny with plenty of pressure filled the little holes. 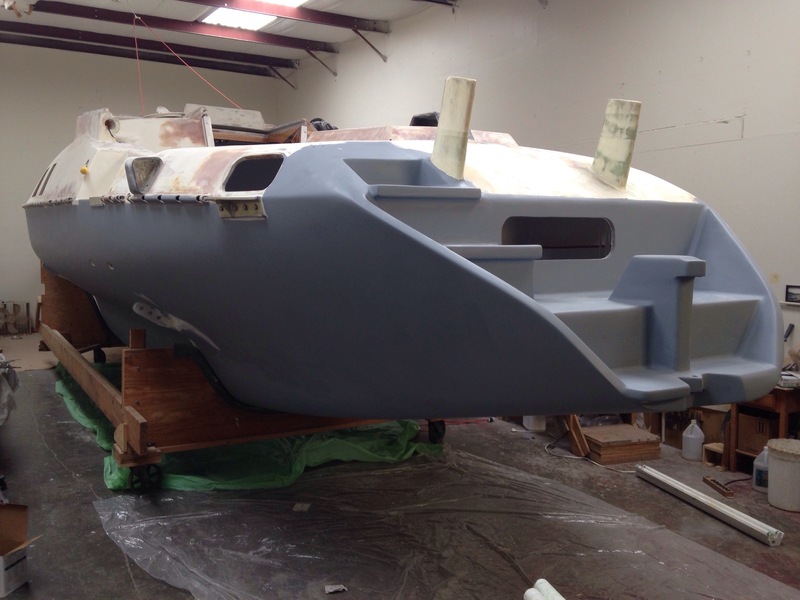 And finally, we’re starting to imagine a painted boat. 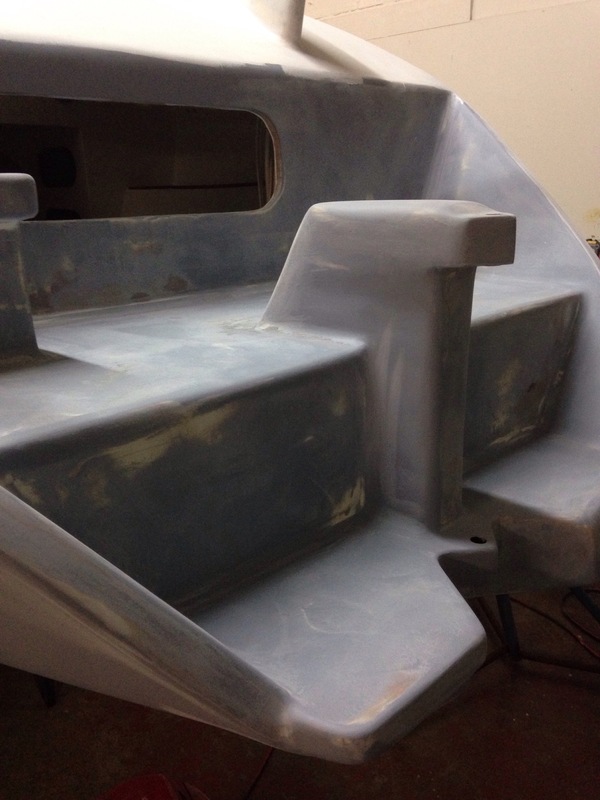 This primer is similar (but darker) to the platinum grey final color of the topsides. It’ll go up to the net lashing tubes. 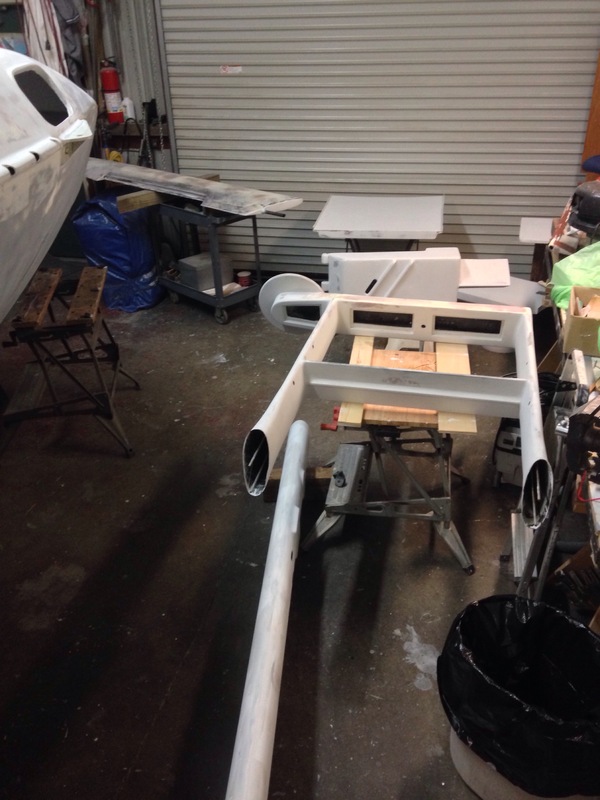 This is probably about the fifth time I’ve said “one last little external build piece to go…” We had assumed the bow pulpit would be build in steel post-launch. But since we’ve been on the roll of eliminating metal, why not here? Now I want to get this done and glassed in before painting the deck. Here’s a mockup of thin glass that was wrapped around PVC. Thinking we’ll carve this shape from styrofoam, glass that, then dissolve out the foam to form hollow tubes. If anyone has tips on this, or a better way to form the curves, we’re all ears. 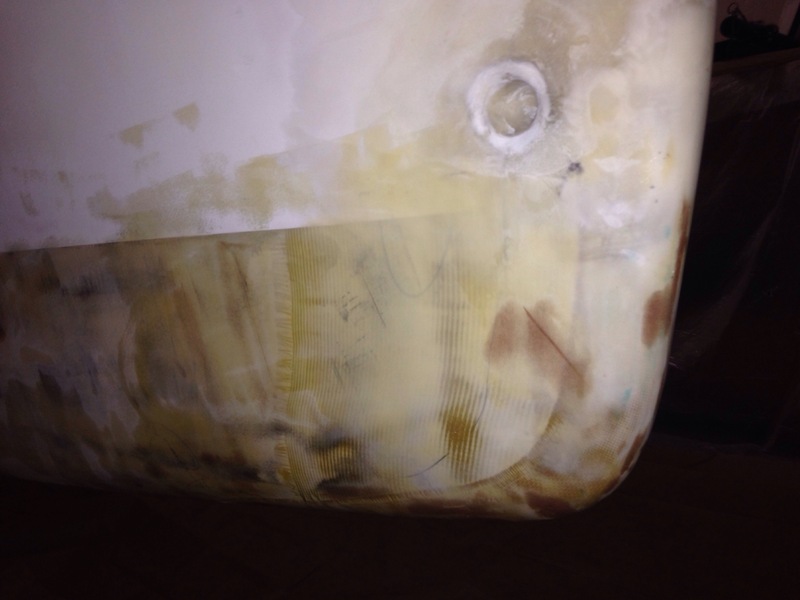 This boat hull was built 15 years ago. 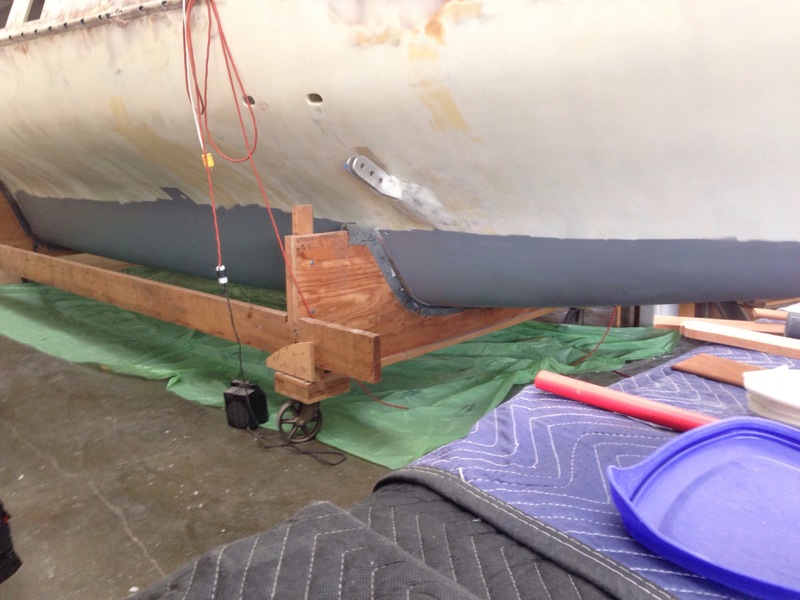 The deck and topsides got a primer coat 5 years back, but some of you will recall the bottom wasn’t faired until just a few months ago. 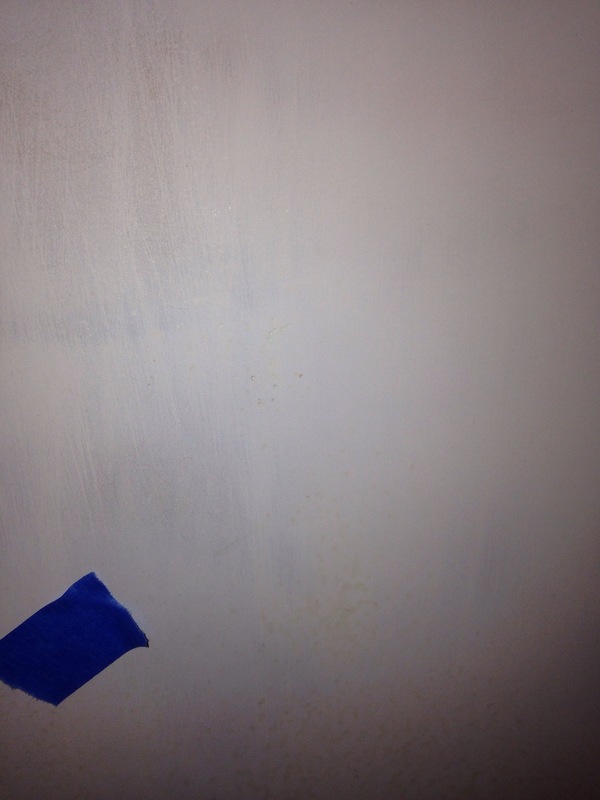 But tonight, a decade and a half late, the raw underwater skin was painted with the first of five coats using Interlux interprotect 2000. 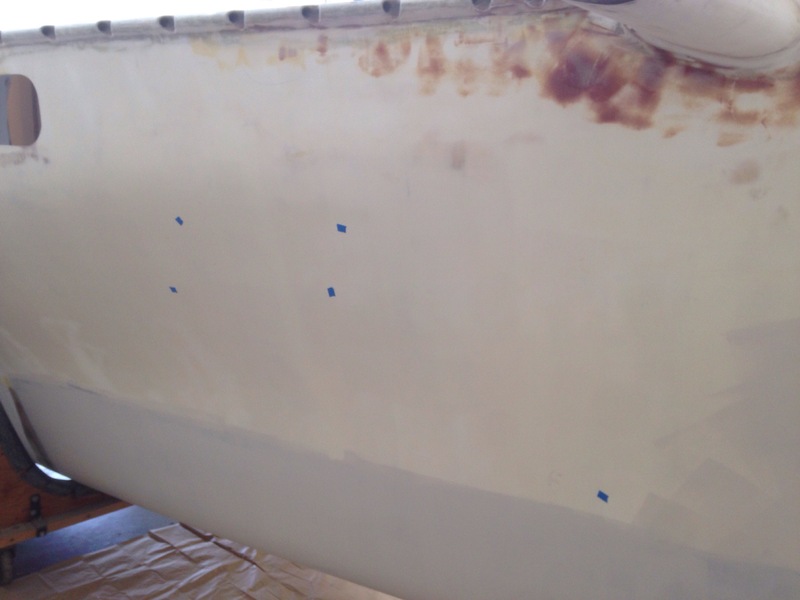 This will create an epoxy barrier coat over the epoxy-skinned hull, so blistering or other water intrusion should not be a future worry. Clearly I don’t get the concept of glamorous self-taken phone photos in picturesque locales. 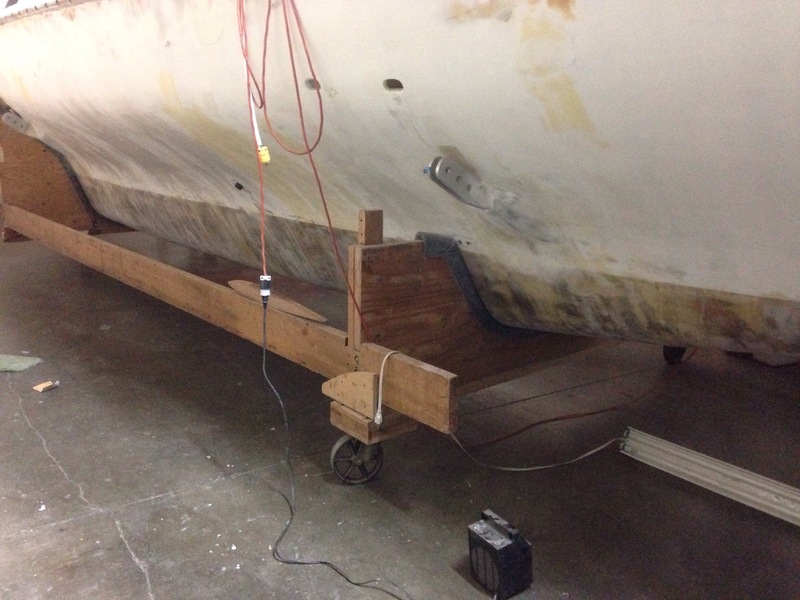 BUT, this is actually a very relieved boat builder. 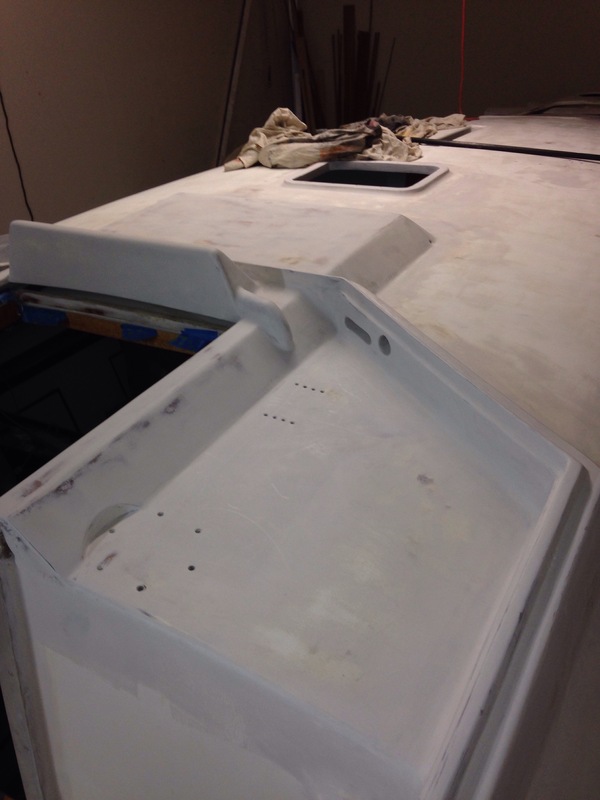 This goes back a few months to our first experience with the very good but rather volatile high end marine topsides primer paint. 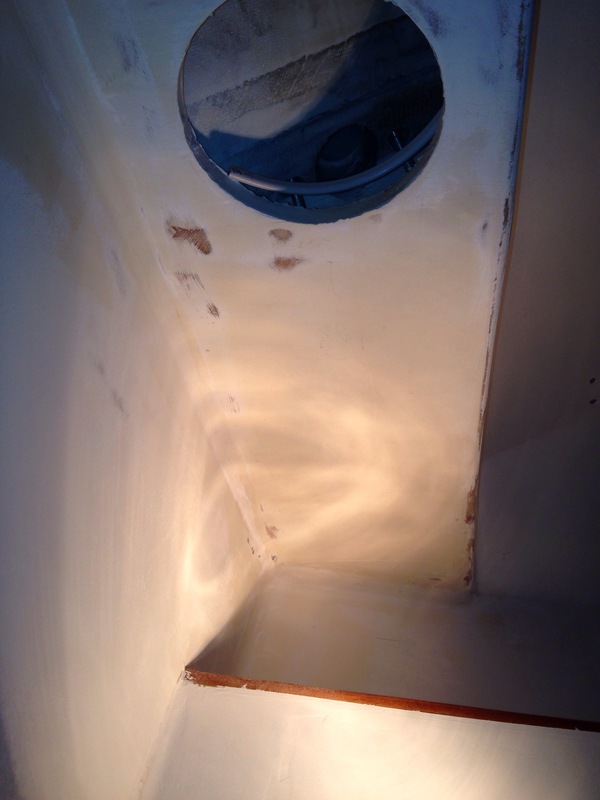 One night I geared up to hit the shower and toilet compartments with the Interlux Primecoat 2 part system. I wore the full face respirator, but neglected any fans to force air out of the space. After about 15 minutes the respirator was overwhelmed, resulting in attacked eyes and lungs. 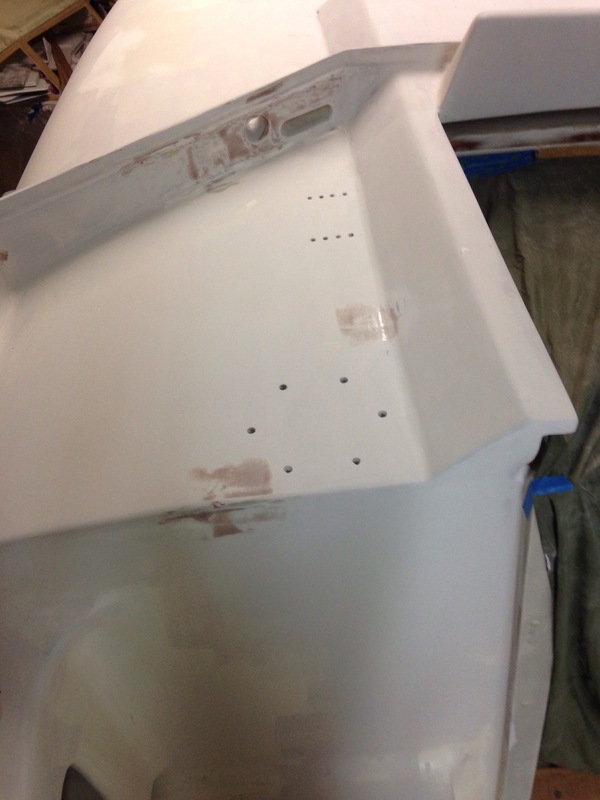 I basically dropped everything, and threw the paint/roller/brush in the trash as I ran out of the shop seriously spooked about painting this boat. 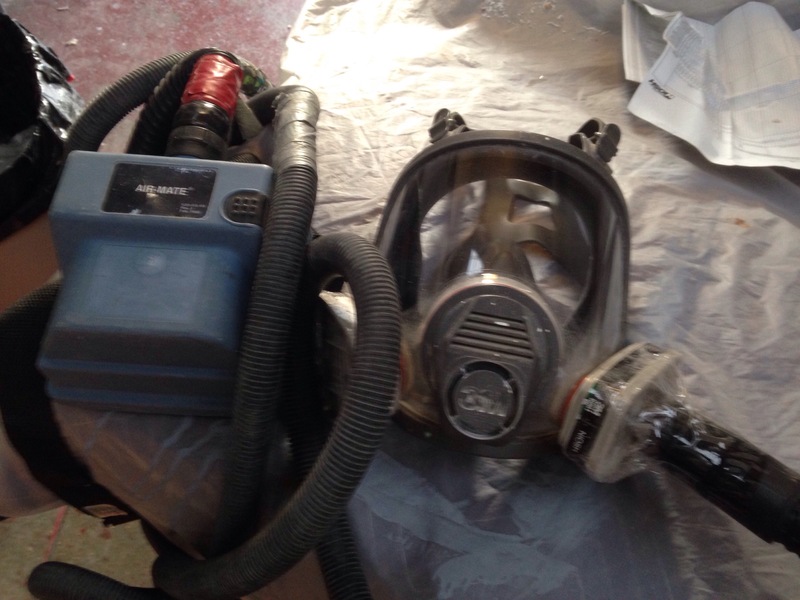 Yep, that’s the good full face respirator with one filter taped completely shut and the other taped off except for the receipt of a long vacuum cleaner hose. The other end of that hose is the output from our oldie-but-goodie 3M belt pack NiCad battery-driven forced air filter. So instead of taking the positive flow filter in to the paint environment the jury rig hose keeps it out in the fresh air, feeding the face mask. Tonight with all the simplified plumbing cabinet and bulkhead revisions finished, the toilet space was prepped along with the abandoned shower, the goofball selfie was taken, and we dove in again with the nasty paint. 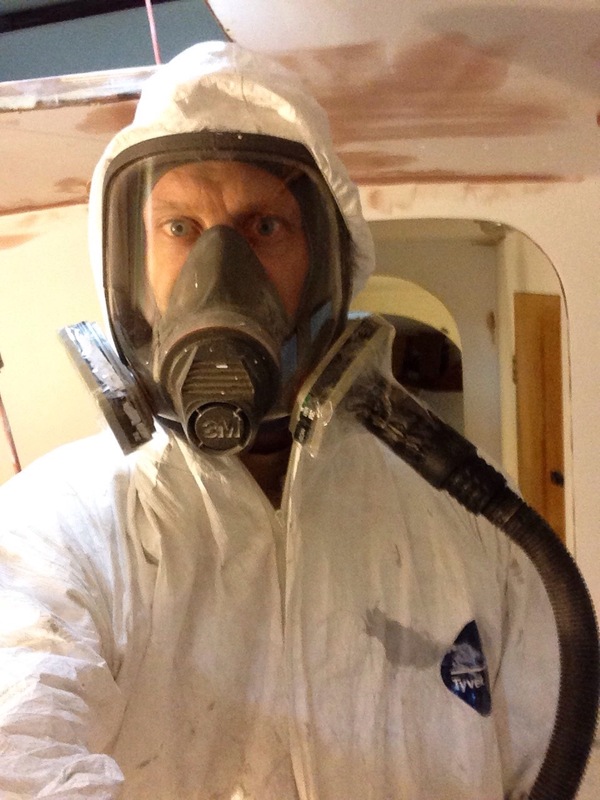 The work took about 30 mins, the mask performed well – no eye discomfort and negligible smelling of fumes. Certainly no dizzying or worrying amounts of volatiles coming on board! That was a big relief and we’re once again seeing the path to paint completion. 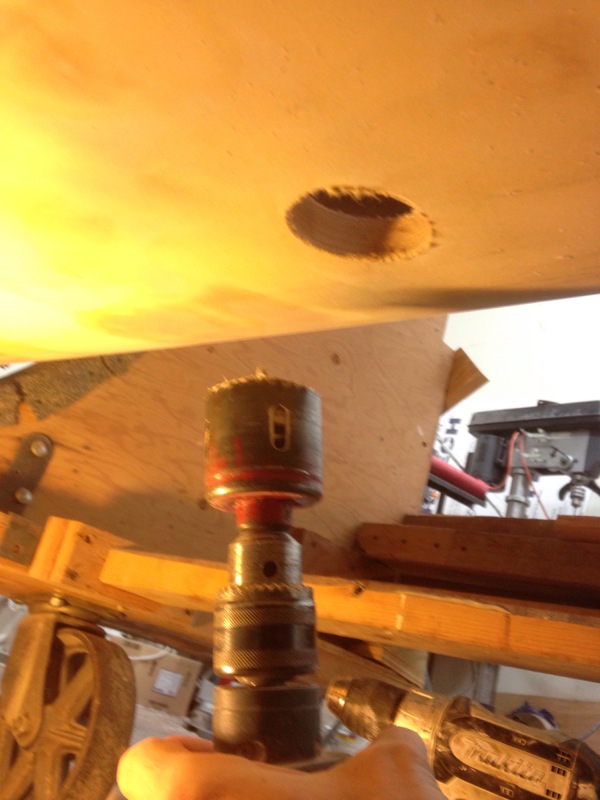 Speaking of plumbing, this week has been finishing those 3 below-waterline through hulls, plus another big one about a foot above the line for the galley drain. 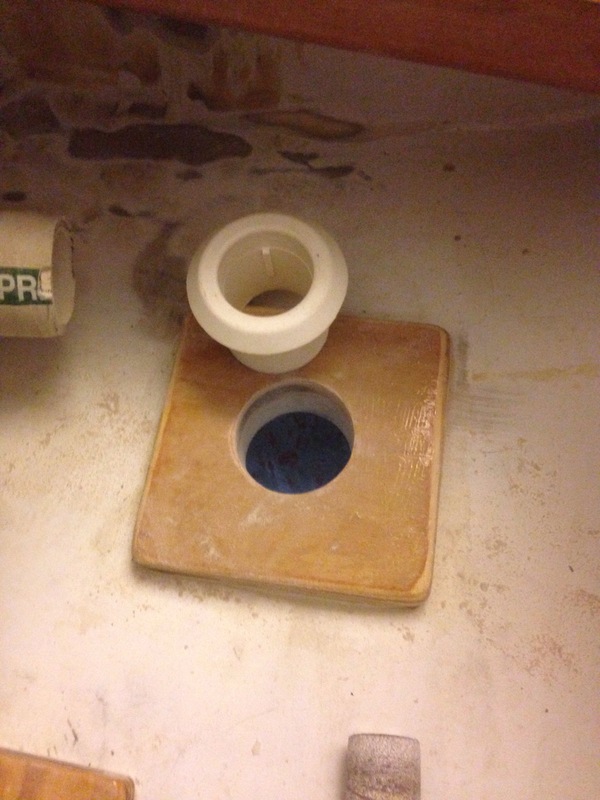 Here’s the process for the toilet tank drain. 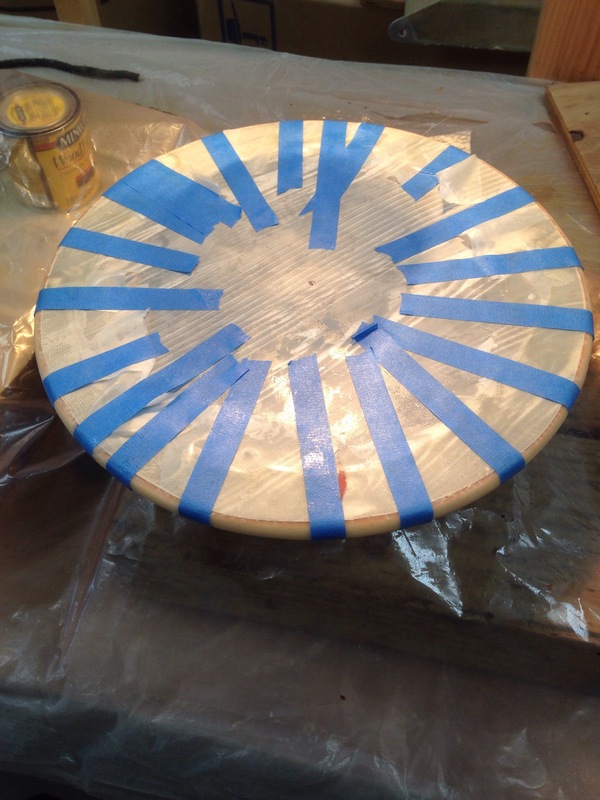 Measure, stare, worry a bit, measure a few more times, then get the hole saw spinning. 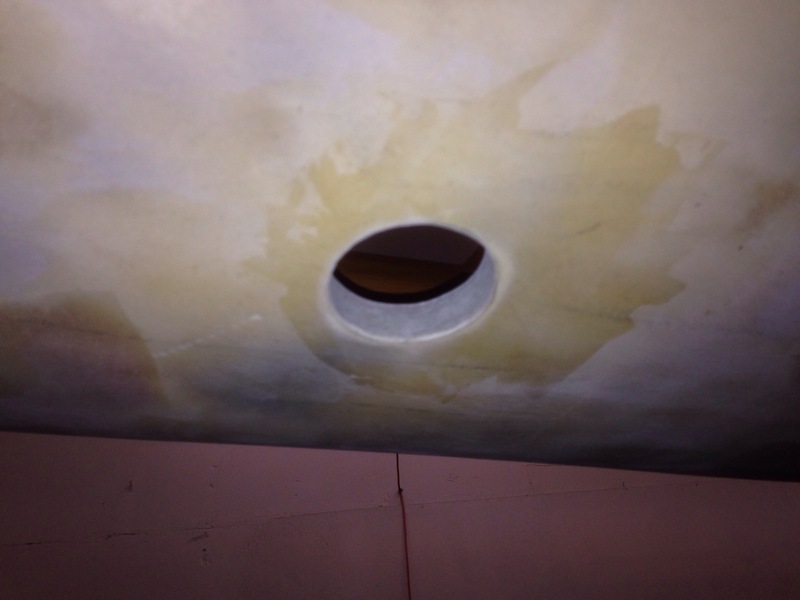 Then fill all that rebated space with solid epoxy/cabosil putty, and after it cured, sand it back flush. 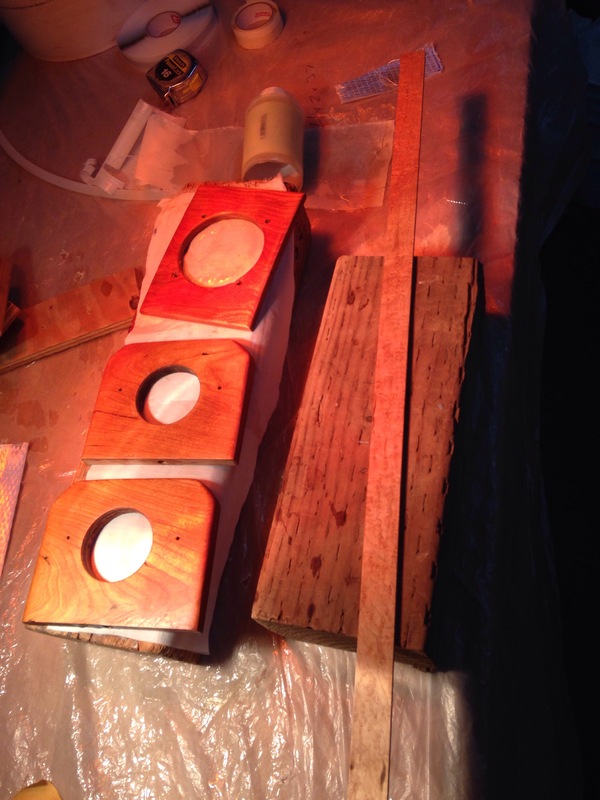 During curing steps we had been making epoxy-coated plywood backing plates for the seacocks. 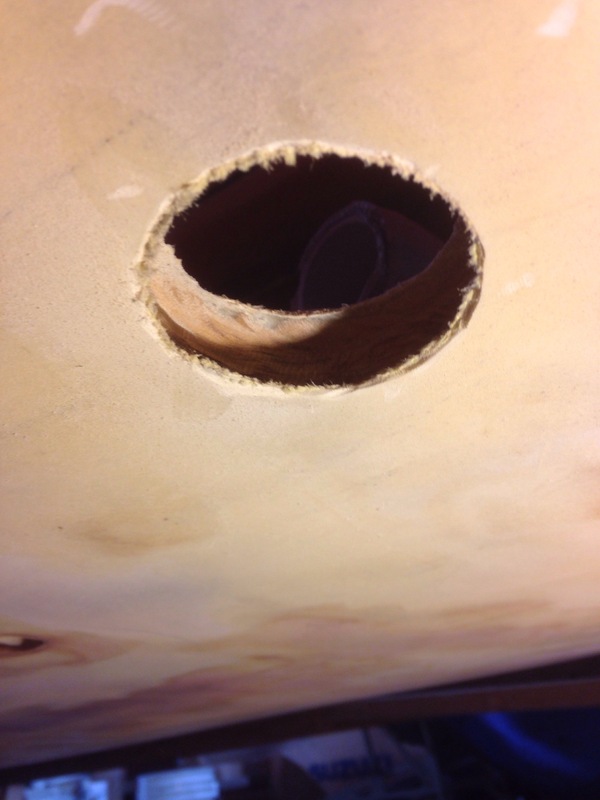 They finished up as the holes were done. 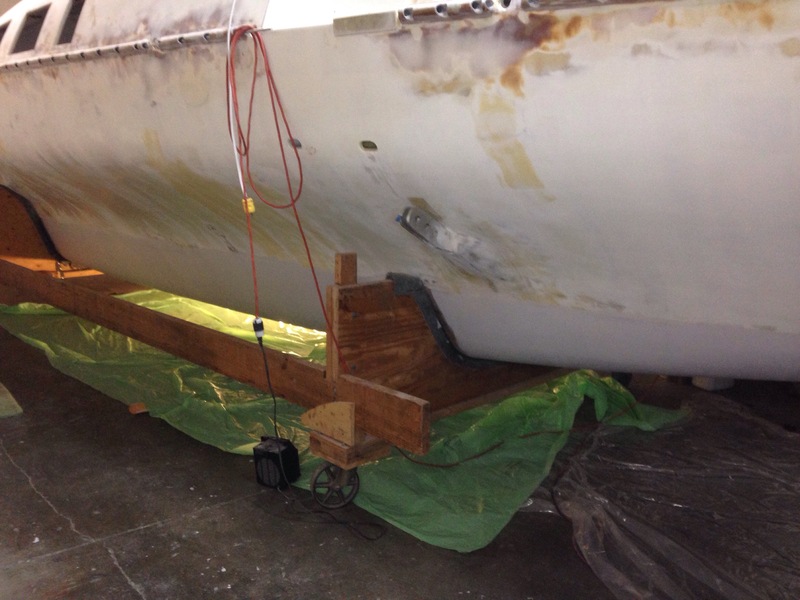 I understand these backers can be loose and mounted with the same sealant as the thru-hull fitting, but we opted for permanently bonding them to the hull and one more shot of putty to smoothly line the thru-hull passage as one watertight unified ‘tunnel’. These two are the toilet tank drain and depth sounder that’ll be close neighbors. 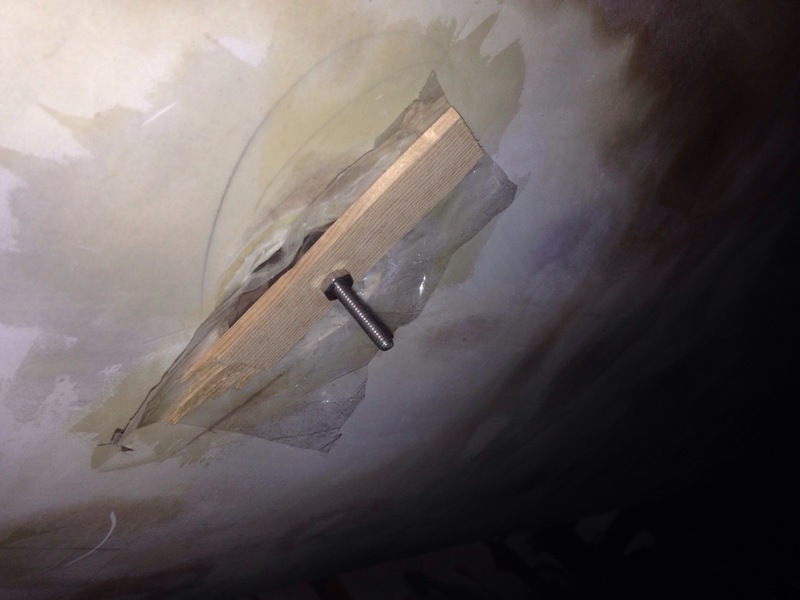 That’s a little bolt & block setup to clamp the backer in to the bonding glue. All four came out just as planned, and now await paint. We’ll show them off again when their fancy Forespar valves are installed. 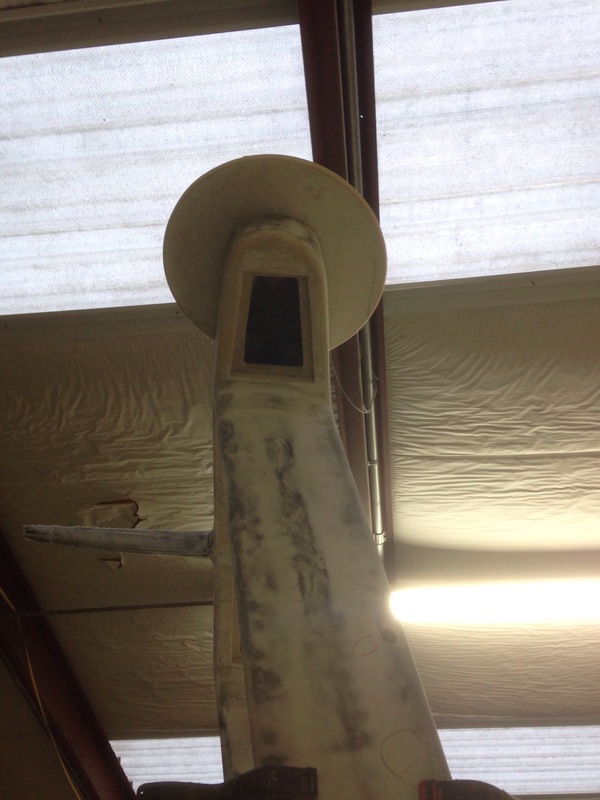 About six layers of primer and bottom paint from now!